No one is more excited for tonight's first presidential debate than Stephen Colbert and his Late Show With Stephen Colbert staff, led by executive producer and showrunner Chris Licht. "It's going to be such an event, and because it's seen on all the networks at the same time, tens of millions of people will see it," said Licht of what could be the biggest debate audiences ever. "And at 11:30, we will be the only place to get a real-time take on what happened." That's because tonight kicks off the first of three live post-debate Late Show episodes over the next month. The show will also go live after the third presidential debate on Oct. 19, and following the vice presidential debate on Oct. 4. The second presidential debate falls on Sunday, Oct. 9, when Late Show doesn't air. 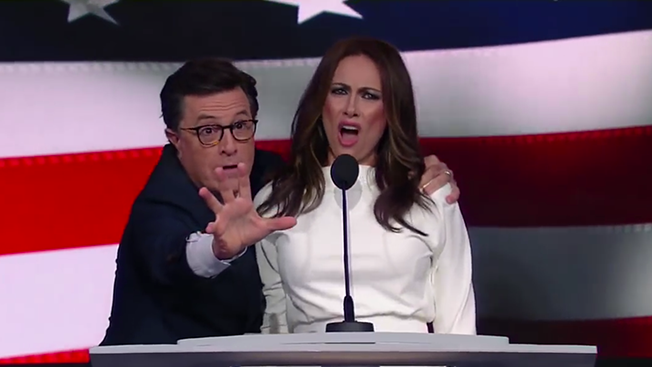 It's the Late Show's return to live shows following two weeks of real-time broadcasts during the Republican and Democratic National Conventions, which gave the show a ratings and digital boost and "energized" Colbert and the staff, said Licht. Those episodes included the revival of Stephen Colbert's Colbert Report persona (much to the dismay of Viacom's lawyers) and the surprise return of Jon Stewart behind a late-night desk, as he took down Roger Ailes and Donald Trump in his first Daily Show-style rant in 11 months. Unlike those heavily themed debate broadcasts, the post-debate shows "will be less razzle-dazzle, special-themed, and more of a typical show that happens to have a very fired-up audience, because live audiences are great," said Licht. "And a supertopical, brand-new monologue, based on what millions and millions of people will have just seen on television." Monday's show won't include any integrations, but Colbert did participate in a "Snapple 2016 Teacision" integration during the Sept. 15 episode. Licht, who was previously the executive producer of CBS This Morning, arrived in April as new executive producer/showrunner. "I always looked at my job to be, remove anything encumbering [Colbert] from creativity and being himself," he said. "I think what the biggest issue was is he had so much of the show on his shoulders that he didn't have that opportunity." But Licht also injected more urgency and timeliness into the broadcast, especially with the decision to do the live post-convention shows. "It just seemed natural. If we all decide that our mission in life is to be the most relevant and topical show, then you cannot fulfill that mission if you're not live," said Licht. Before those convention episodes had concluded, the team quickly realized they wanted to do more live episodes. "I think we were feeling it even during the second week, like, wow, these have been really smooth, and very rewarding. When else does it makes sense to do it? Oh, for the debates," said Licht. And, perhaps, on Election Night as well. Last month, Showtime Networks president and CEO David Nevins made the "half announcement" that Colbert would host a live comedy special for Showtime on election night, Nov. 8—probably. "I think it's going to happen," Nevins said then. "Stephen wants to do it. I want to do it. The studio wants to do it." There's still been no official announcement (the Late Show won't air on election night, which would free Colbert up to appear on CBS' sister network), but "it's definitely something that I would expect to happen," said Licht. "There's a lot of i's to dot and t's to cross, but it is moving along." But beyond the appeal of live telecasts, those convention shows represented a turning point for the Late Show. "There's a lot we were able to take away from what worked during those two weeks. I think the interviews really had a sense of urgency to them, so there's a lot you can replicate. And that's what we're letting sink in, to each department: 'Okay, what really worked?' 'Well, we didn't have a lot of time to rewrite, so … oh, that's interesting.' So it was a good learning experience, as well as being a shot in the arm," said Licht. Going forward, "I think a general theme is that we will take more chances. We will be less safe. We will try to get in trouble more. And by trouble, I mean, take more risks," said Licht. "Because I think the biggest sin you could be is predictable and boring, and the antidote to that is to take bigger chances." That risk-taking mantra is in stark contrast to Late Show's biggest 11:30 p.m. competition, The Tonight Show Starring Jimmy Fallon, which came under under fire earlier this month for Fallon's softball interview with Donald Trump, raising the question: What is the role of late-night shows and hosts during this election? Variety TV critic Sonia Saraiya wrote, "If Jimmy Fallon had any credibility left as a thinking comedian with a point-of-view, he lost the last shred of it last night." Meanwhile, both presidential candidates visited The Tonight Show in recent weeks, and Jimmy Kimmel Live this summer, but have stayed away from The Late Show since last fall. Instead, Colbert frequently interviews "Cartoon Donald Trump" and "Cartoon Hillary Clinton." "The answer I give you now is the answer I would always give you, and that's just that we are a curious, authentic show, so if we have a political figure on, it's going to be a real conversation," said Licht. "And we have an open invitation to all the candidates to come on." That post-convention shows gave the Late Show new buzz and relevancy, but hasn't translated into a long-term rating gains. The Late Show remains a distant second to The Tonight Show, and two weeks in the past month, it fell behind Jimmy Kimmel Live in the 18-49 demo. But last week's appearance by first lady Michelle Obama gave the show its largest Tuesday audience since last October, and its highest Tuesday demo rating since May. "I think we all feel that each show we did is better than the one before," said Licht. "We get a lot of sampling when you have someone like the first lady on. That doesn't mean the next night you're going to have the same number, so it's really trying to do smart shows with guests that can attract wide audiences, then [get them to] resample our show." And the live Late Shows won't cease when election season does. "The bar is pretty low for us to go live if there's a reason to do it," said Licht. "We could do it in pretty short order, so I would not suggest that when the debates are done, that is the last you'll see of live shows."